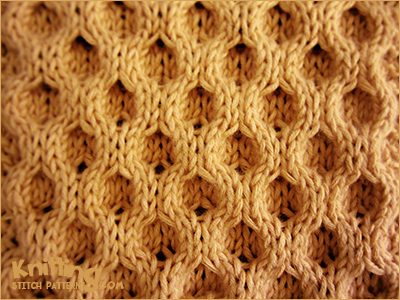 The Aran Honeycomb stitch is worked in multiples of 8 sts with whatever you want on either side. Row 1 -Right side: Knit. Row 3: * 2/2RC, 2/2LC; repeat from * to end. Row 7: * 2/2LC, 2/2RC; repeat from * to end. Repeat rows 1 to 8.